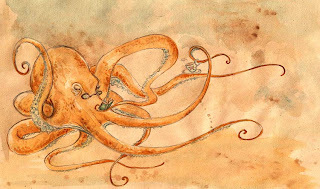 Georgia Dunn Studio: The Pseudooctopus has been featured on TotusMel's Wunderkammer! The Pseudooctopus has been featured on TotusMel's Wunderkammer! This is exciting for me, it's the second time I've had a piece of work featured on the incredible steampunk site TotusMel's Wunderkammer! Click here to see The Pseudooctopus hanging out with some other underwater pals. If you like steampunk, TotusMel's Wunderkammer is a nonstop source of new art, jewelry, and fashion devoted to the style. Over 500 followers agree! Let's go riding way out west! Today I'm featured on "Wave of Life Surf Studio!" Tiny owls, penguins, and hedgehogs oh my! Amazing reward for believing in magic today! A bear on a bicycle and a hedgehog in the rain.